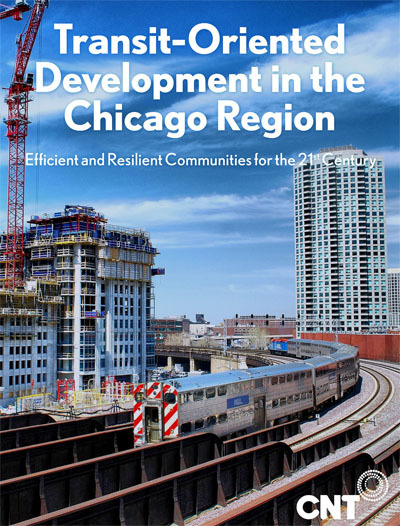 In Transit-Oriented Development in the Chicago Region: Efficient and Resilient Communities for the 21st Century, CNT researchers evaluated the dynamics of the Chicago Region’s 367 fixed Metra and CTA rail stations and station areas between 2000 and 2010. Using the National TOD Database, a first-of-its-kind web tool developed by CNT that provides access to comprehensive information about more than 4,000 transit zones across the United States, researchers identified the transit zones that performed well: those that anchored vital, walkable communities that possess an affordable, high quality of life with minimal impact on the environment. While Chicago made significant investments in TOD during that time period, researchers found that peer cities (based on extensive transit system size) had more successful development of transit zones. Six case studies. Five recommendations.